A week before Donald Trump shocked the world with a stunning victory, another American caused rumbles around the world with an epic underdog win. Qui Nguyen, the rank outsider in the World Series of Poker November Nine main event, became the poker world champion with a sensational success over seasoned pro Gordon Vayo. Nguyen claimed a cool $8,005,310 for his WSOP efforts in Las Vegas and finished with a grin that was almost as wide as the stack of cash on the table in front of him. The November Nine is the daddy of all poker tournaments. It’s the bracelet all the elite players want – think of it like the Super Bowl, World Cup, Ryder Cup and Olympic Gold all rolled into one. The battle to reach the November Nine showpiece began back in early July, when a mighty 6,737 WSOP players flew into Vegas and each shelled out ten grand for a spot at the tables. Ten days and nights later and the final nine were confirmed. Of these gambling titans, two-times world champion Cliff Josephy was the standout star and clear tournament favourite. His £810,358 WSOP career earnings, and $2,641,420 live poker winnings, dwarfed Nguyen’s paltry $52,986 career prize pot. Cliff’s starting chip count going into the November Nine was 74,600,000 to Nguyen’s second-placed 67,925,000. Vayo, Kenny Hallaert, Michael Ruane, Vojtech Ruzicka, Griffin Benger, Jerry Wong and Fernando Pons also earned their shot at the $8 million top prize. 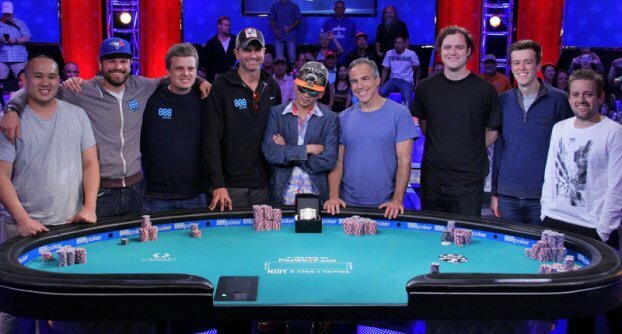 Each were guaranteed $1 million for making the famous November Nine Main Event. On day one Pongs, Wong and Benger were the first three to hit the rails. Hallaert bit the bullet next as the excited crowd watched on. Nguyen, Josephy and Vayo were the last three in action after day two, with Nguyen holding well over half the chips in play (197,600,000) when they returned to the table for the final fight on day three. Vayo eliminated Josephy, who pocketed $3,453,035 for his third-placed finish, leaving Nguyen and Vayo to contest a tense heads-up match. It lasted for eight thrilling hours in which San Francisco resident Vayo held firm and fought methodically, but his weaker chip count always kept the pressure on – in Hand 209 he pondered for seven minutes before finally folding with a two pair. It took until Hand 364 before Vayo was finally cooked. The crowd rose to their feet and Nguyen’s supporters couldn’t believe what had happened. Poker players need to move fast to keep up with the gaming news these days, and this win was easily the biggest story of the year. Qui’s journey has been remarkable to say the least. He moved to the States from Vietnam some 15 years ago and began playing at the tables a couple of years later. In between he scraped a living working in Nevada nail shops, but always with the dream of making it big time in the poker world. At 39 years old he must have thought his chances were slipping away, but his form in the 2016 WSOP shot him into the limelight and his spot in the November Nine was testament to his talent and ice-cool nerves. While Trump readies to take his place as the world’s most famous leader, Nguyen is already the poker world champion and proudly shows off his $50,000 diamond and gold WSOP bracelet. Only in America, folks.